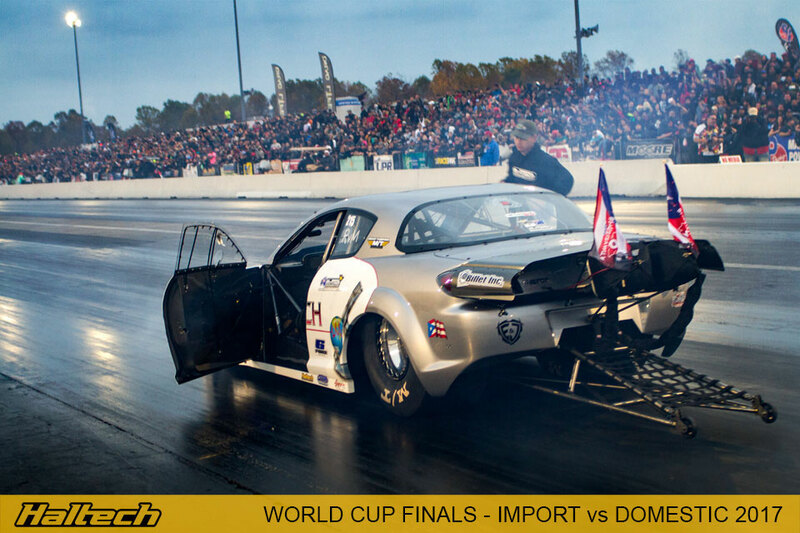 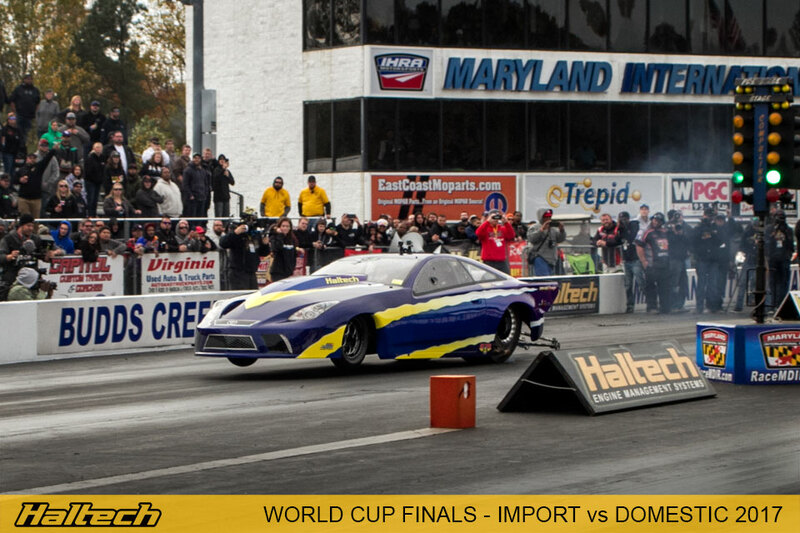 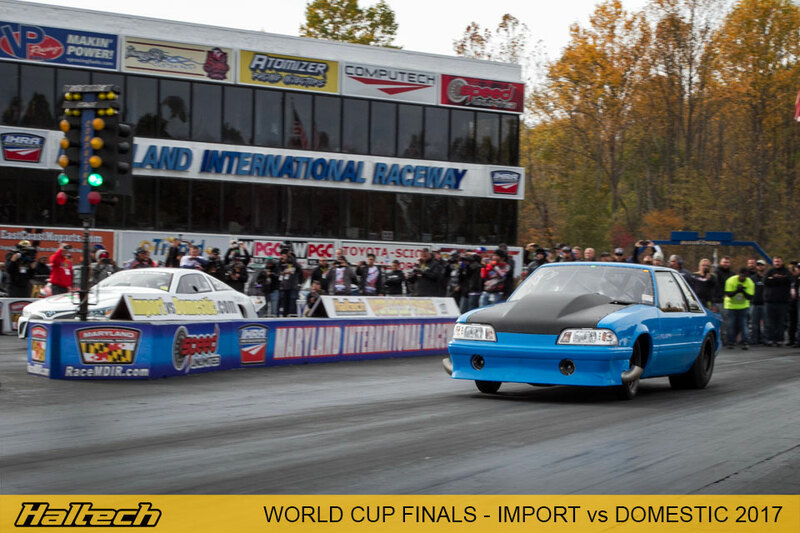 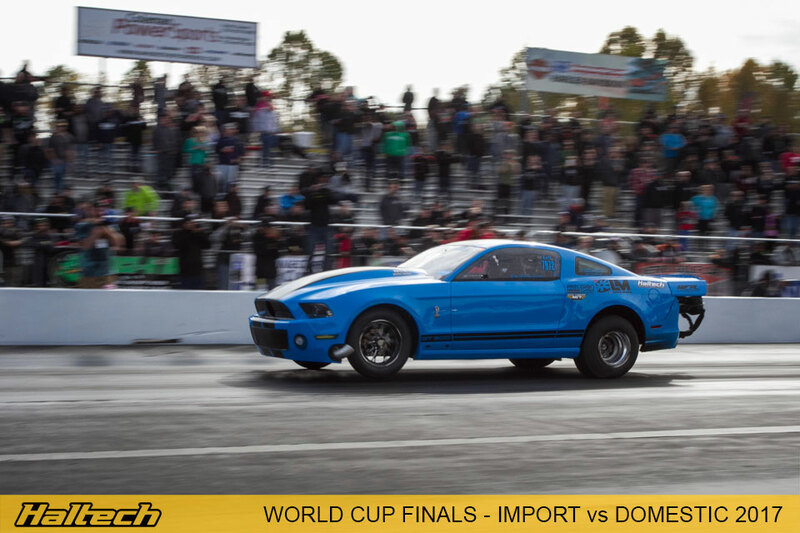 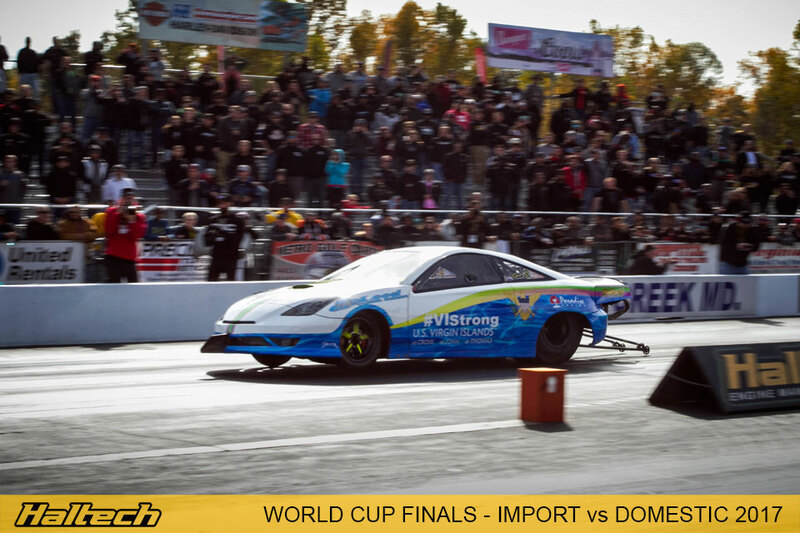 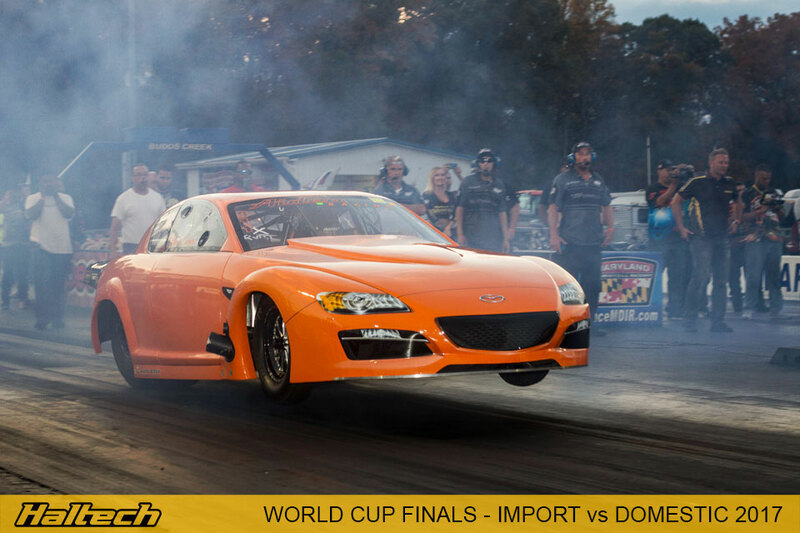 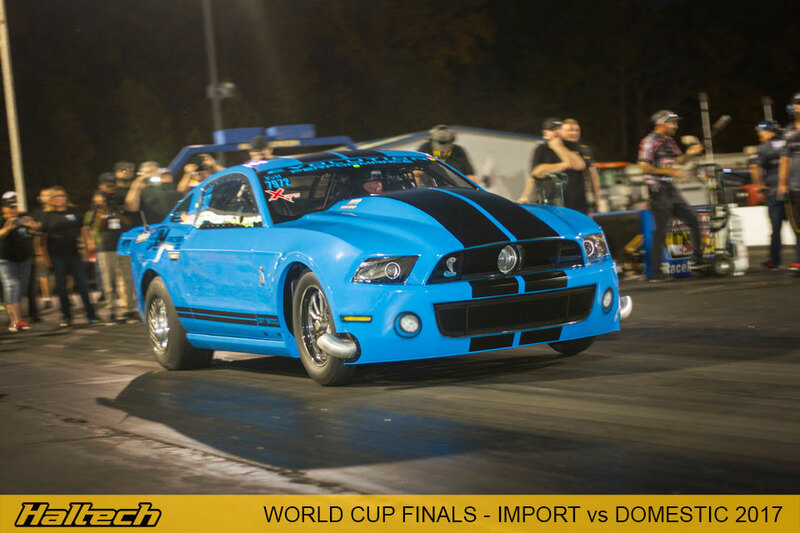 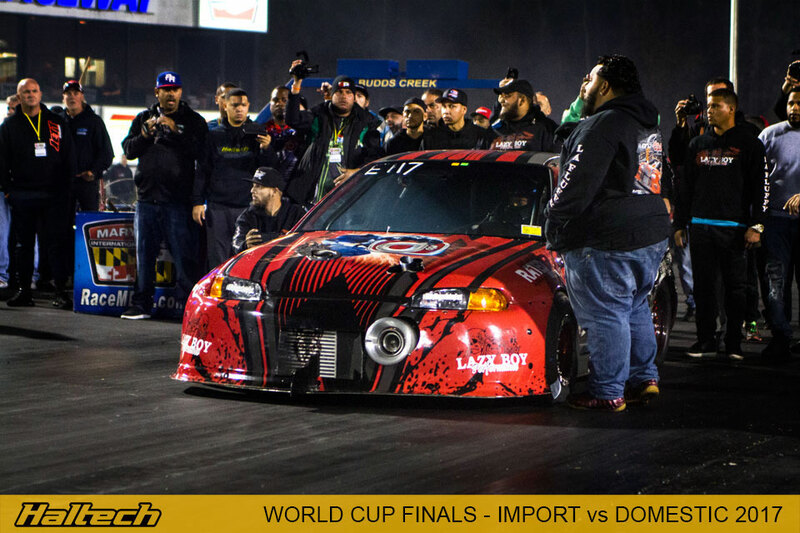 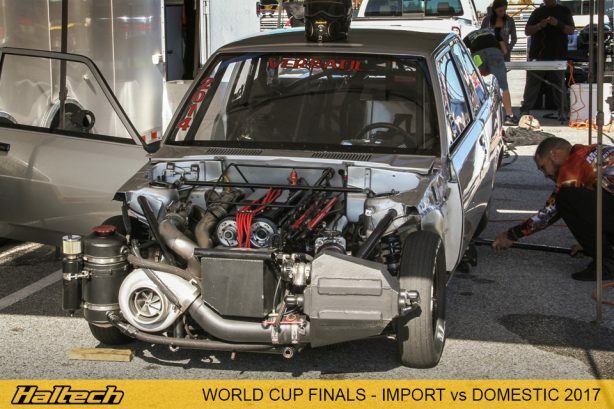 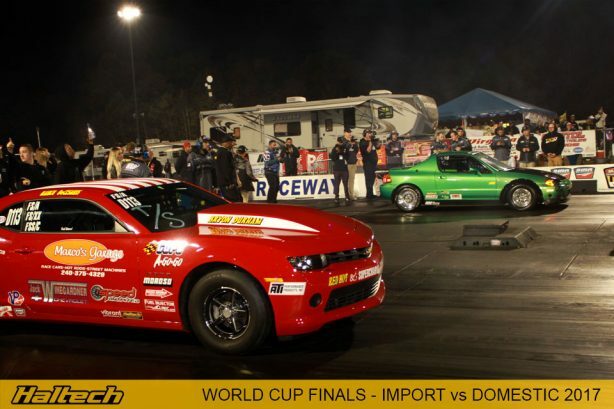 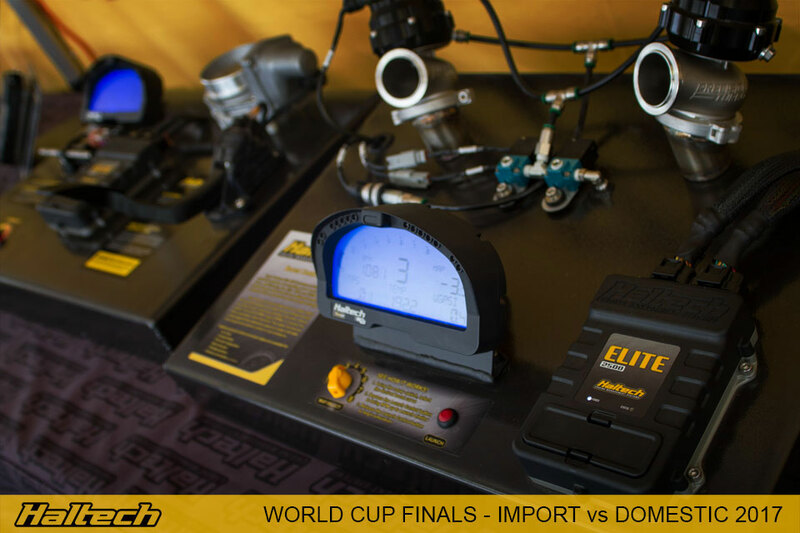 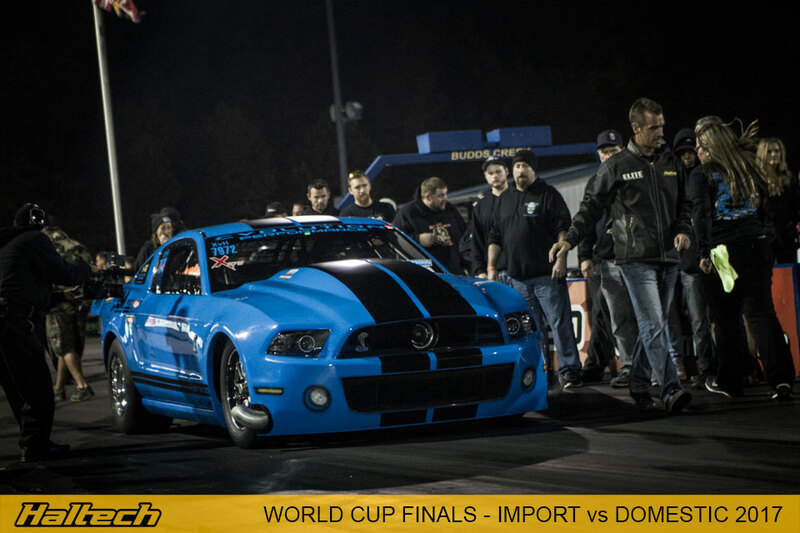 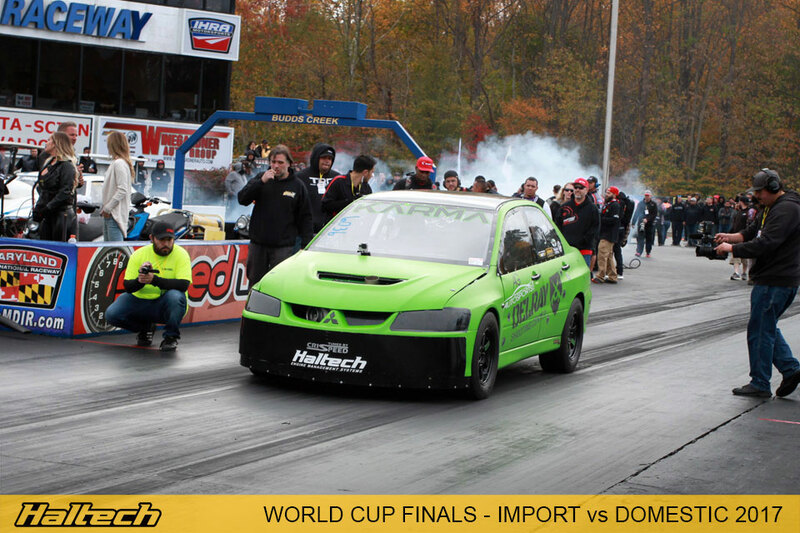 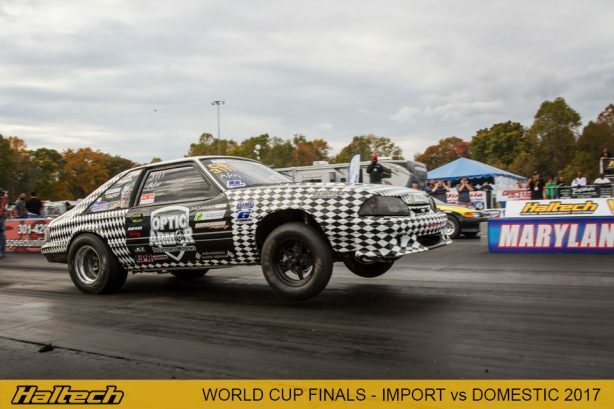 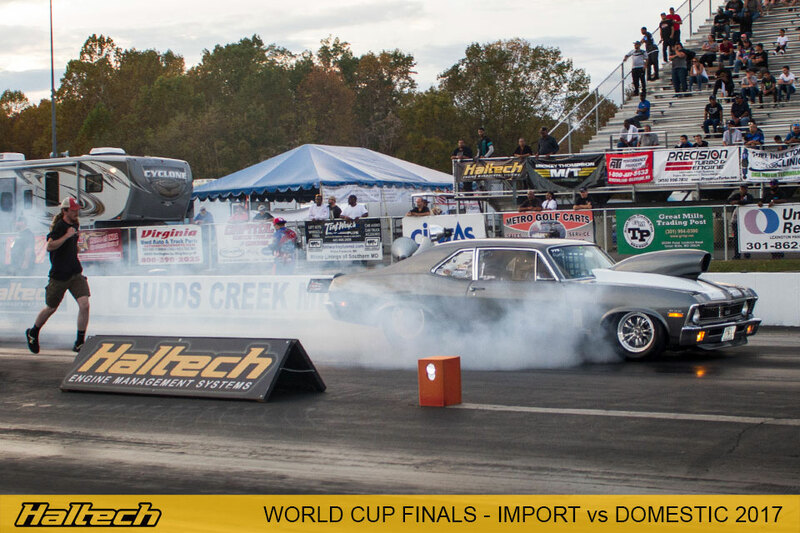 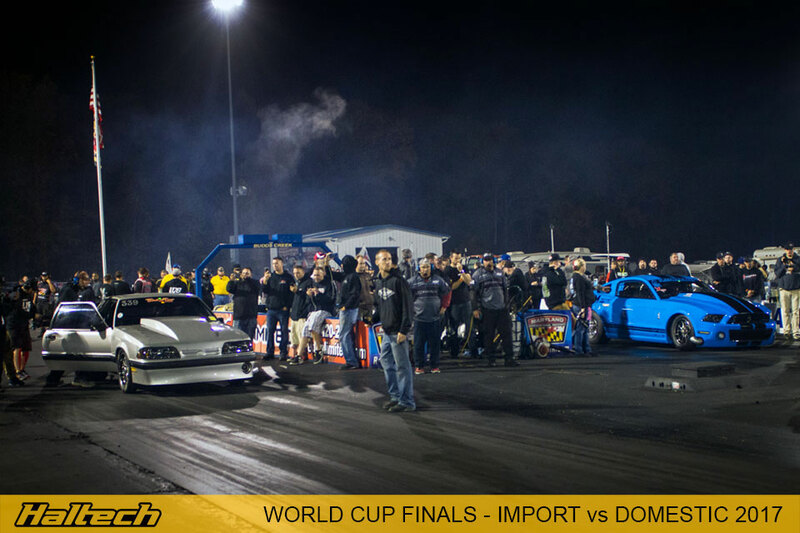 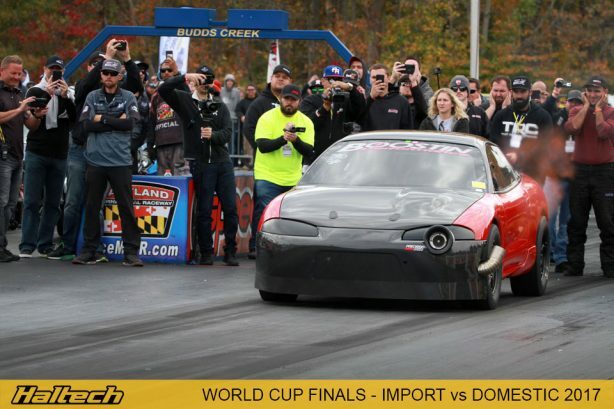 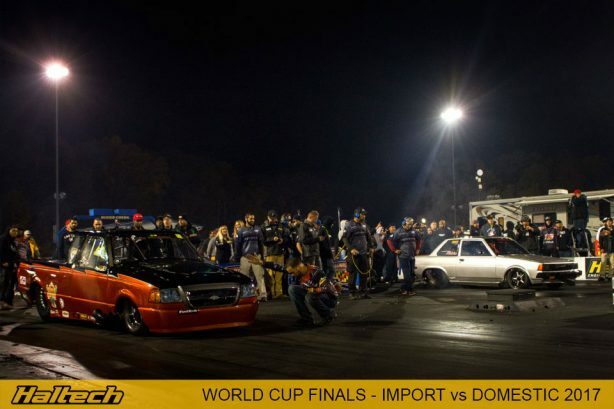 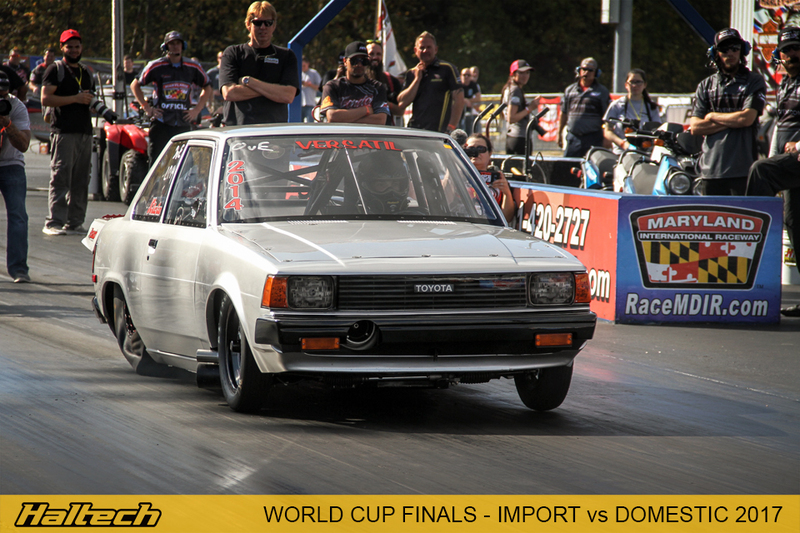 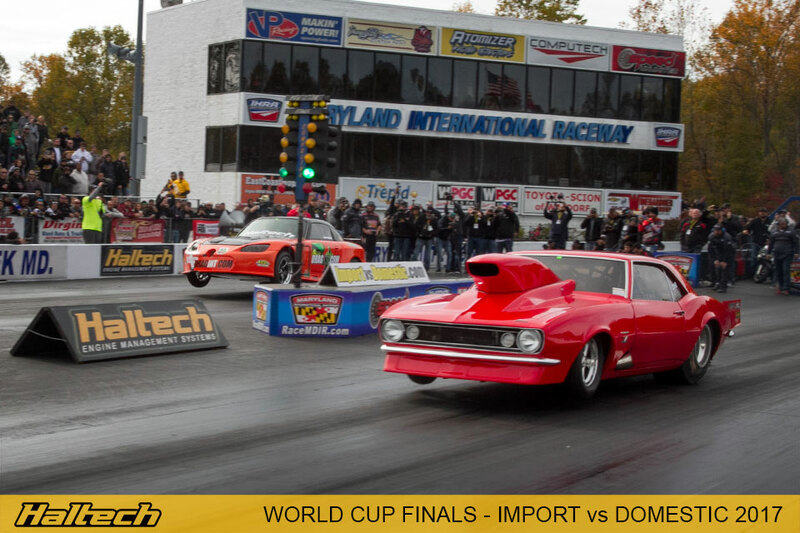 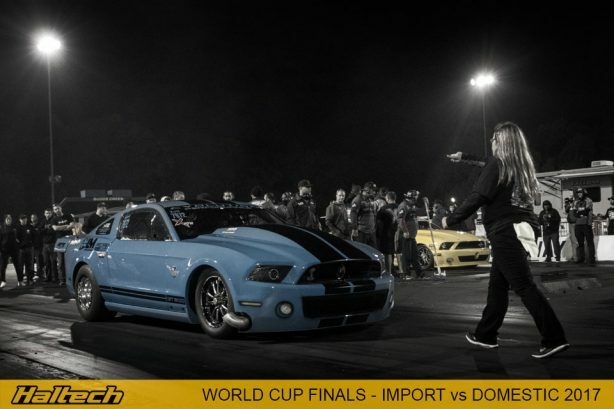 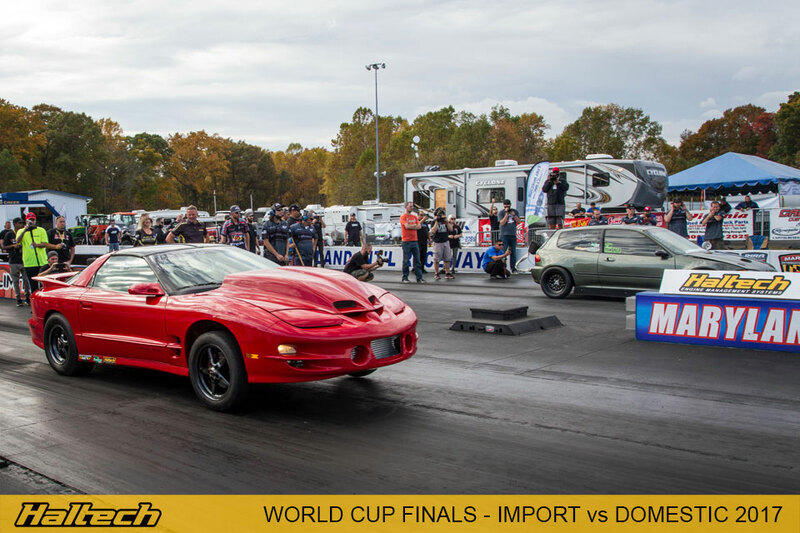 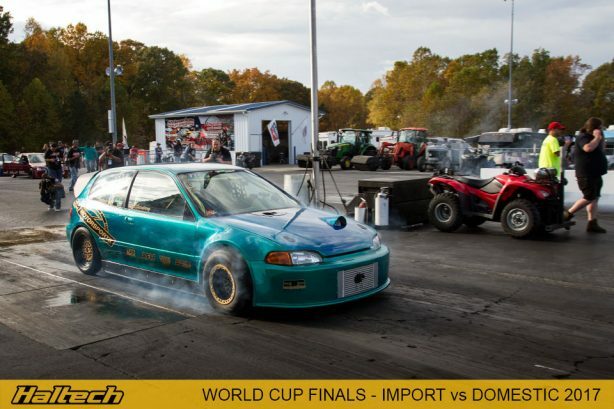 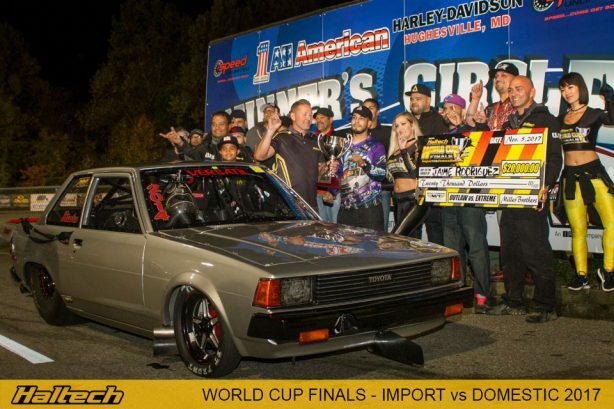 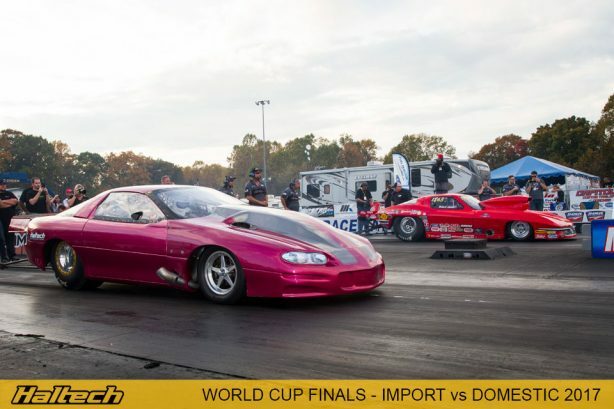 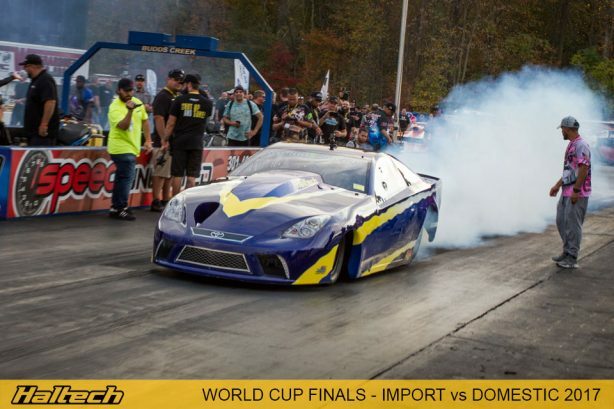 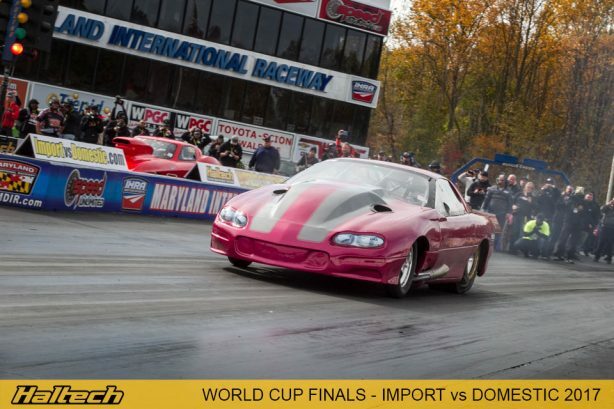 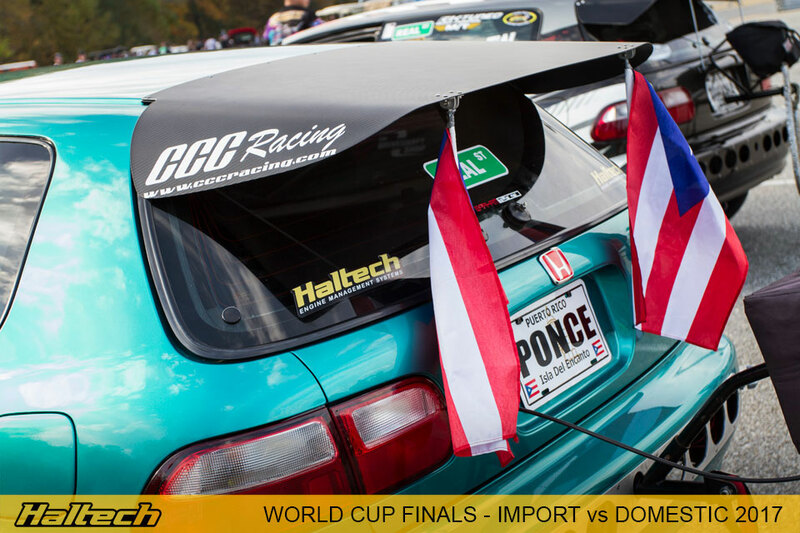 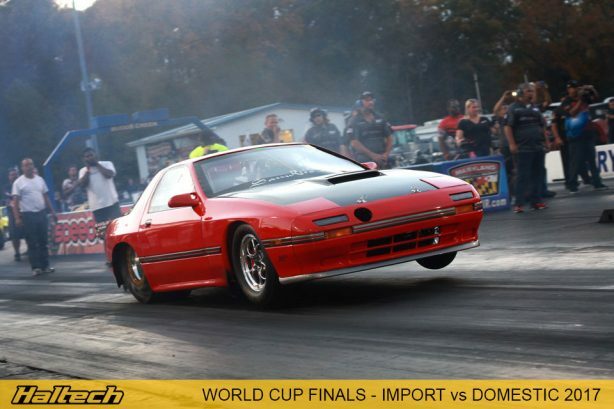 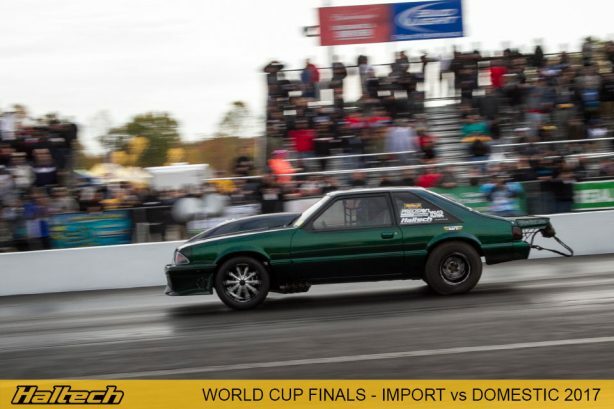 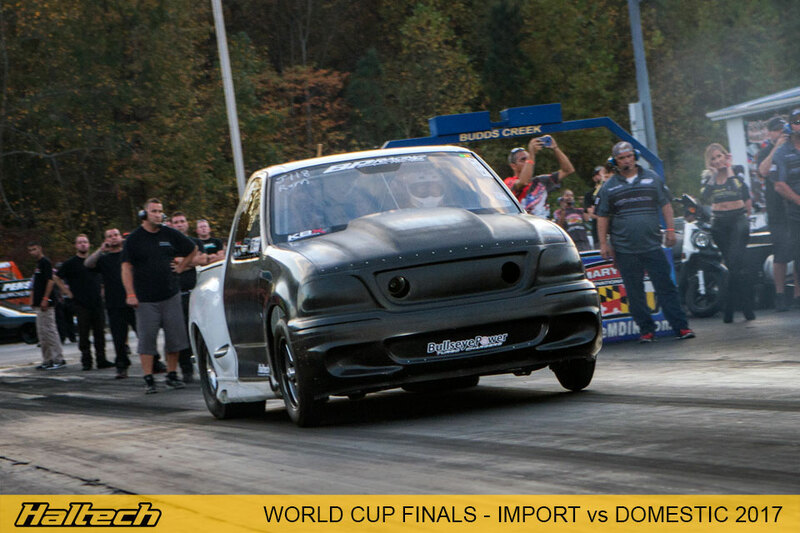 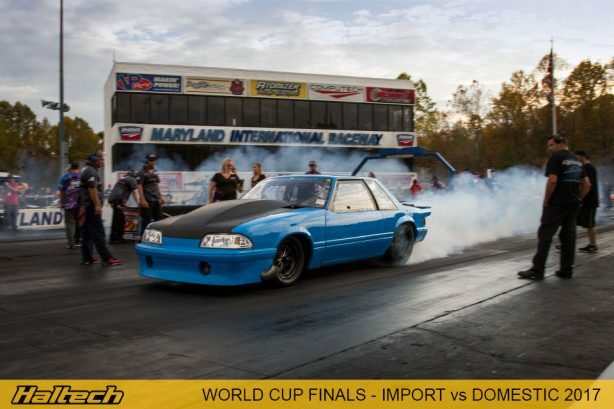 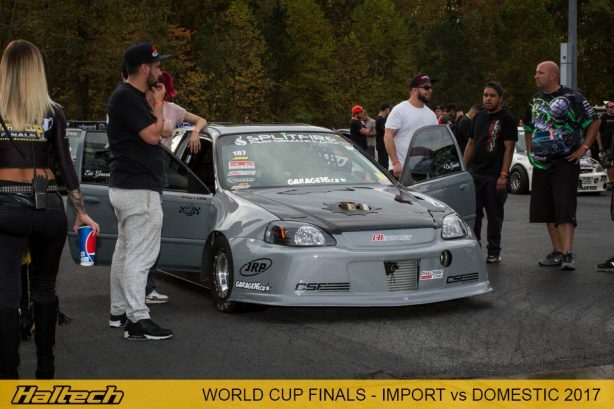 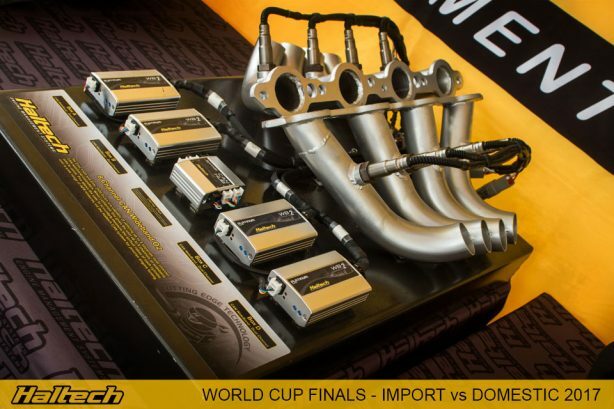 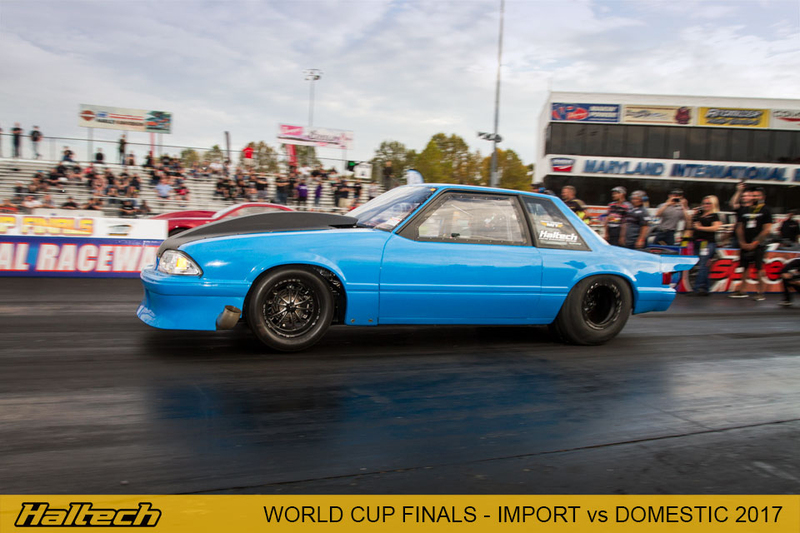 The 22nd annual Haltech World Cup Finals – Import vs. 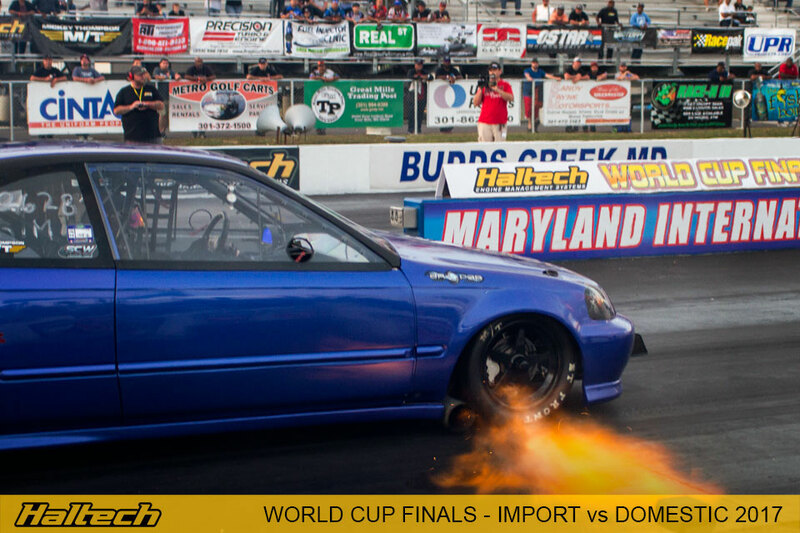 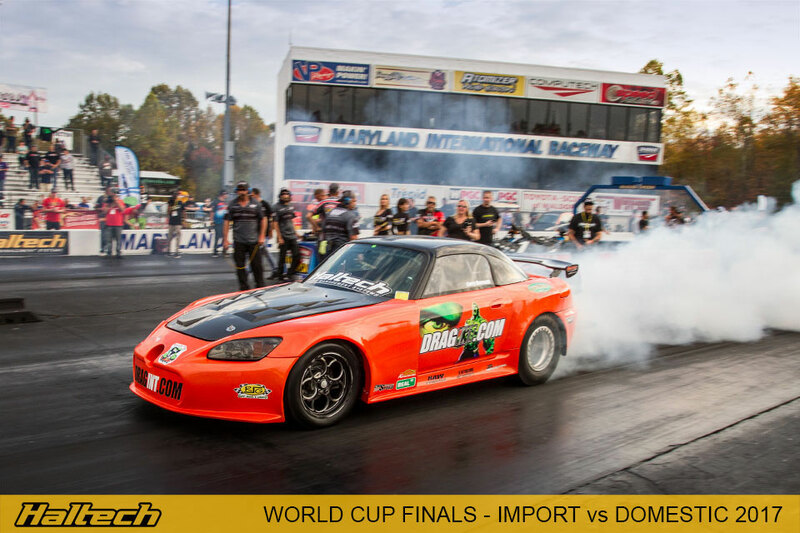 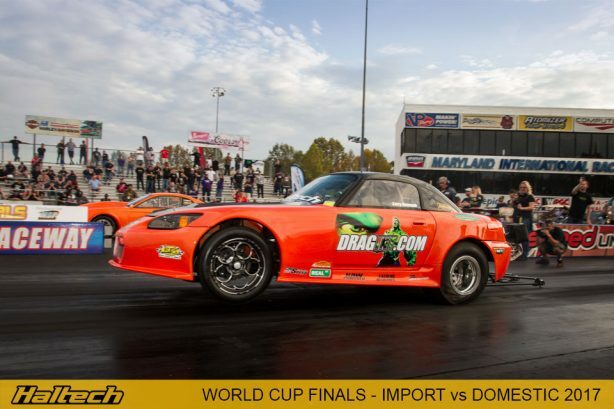 Domestic event held at Maryland International Raceway was the biggest event of its kind in the world! Featuring Import vs. 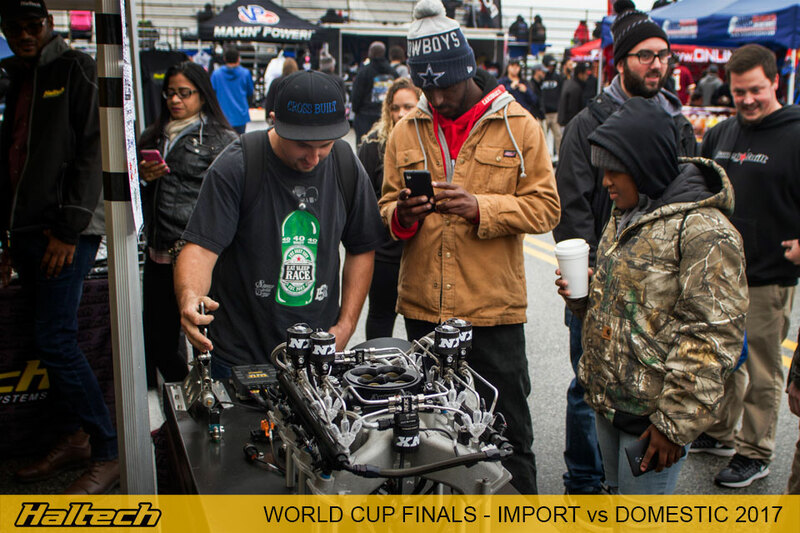 Domestic Drag Racing, a Custom Car Show, a Bikini Contest, a Huge Vendor Midway, and even a Live DJ, the event certainly proved popular, because despite some fairly ordinary weather the venue was at full capacity. Cold temperature during the qualifying rounds made for some exciting racing and saw many teams PB. Weather deteriorated on Saturday afternoon cutting short the qualifying sessions. The rain continued overnight delaying the start of the main event on Sunday while the track was being dried and prepped. 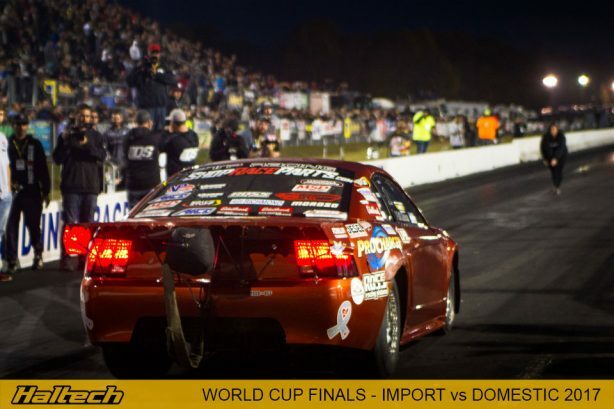 Racing started at midday with the finals going well into the night. It was a huge weekend for all involved! The event brought together racers from just about every type of genre in drag racing featuring the top cars from just about every sanctioning body in the country. 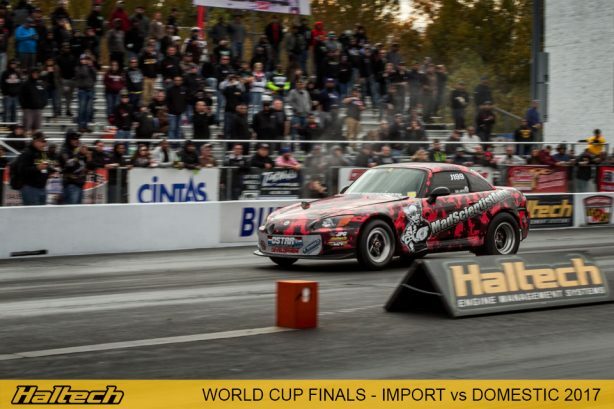 Haltech was well represented at the event with a number of Haltech-powered cars breaking personal bests, and going on to semi finals and finals. 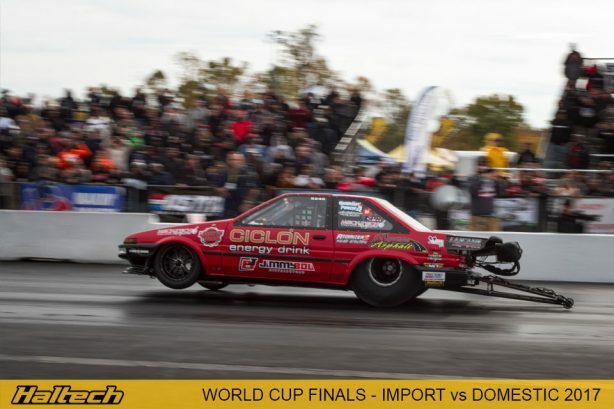 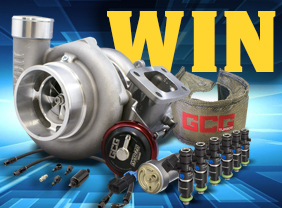 A huge congratulations must go to Jaime Rodriguez in the Haltech-equipped, 2J-powered El Versatil Corolla for winning Outlaw vs Extreme – the fastest class at the event! Dale Colllins Jr in the Rasberry Rocket. 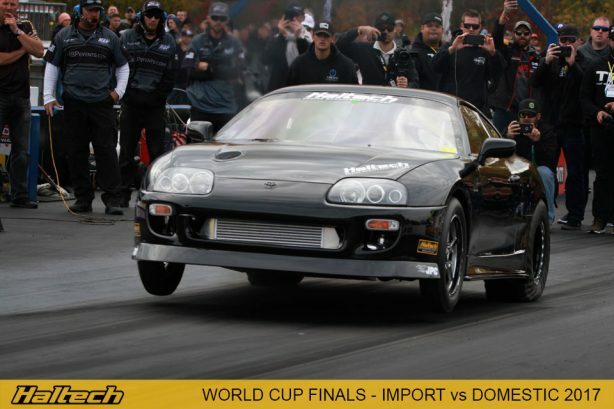 Dales ’02 Camaro is powered by a twin turbo alcohol drinking 481x all Haltech, Elite 2500 + REM, IQ3 logger. Dale made it through to the semis where he unfortunately jumped the gun when racing against Boris Rojas’ in a Toyota Tacoma. 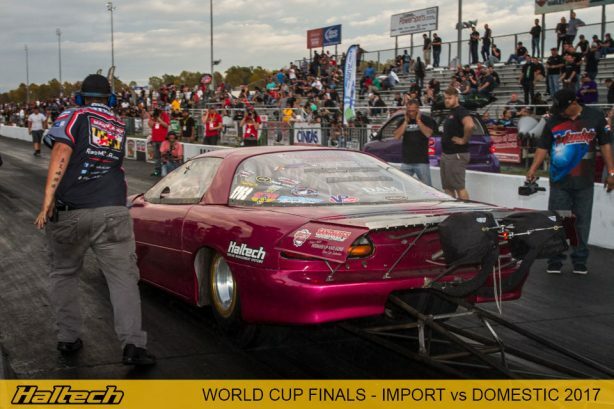 Larry hit a wall in Friday qualifying but managed to get the car straightened out and came back on Saturday to qualify in 20th position. 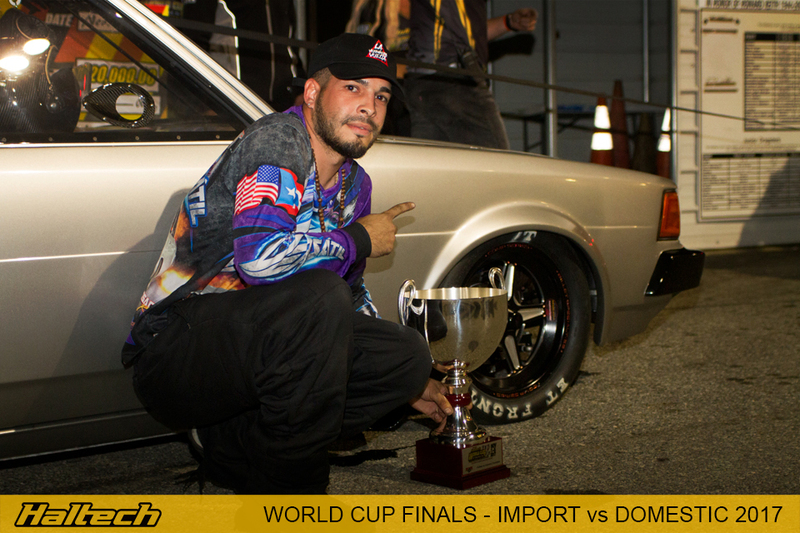 He then progressed to Round 3 where he was defeated by Jorge Juarbe in El Humilde. Haltech superstar Bill Lutz was driving a fox body Mustang belonging to Rob Sphar. 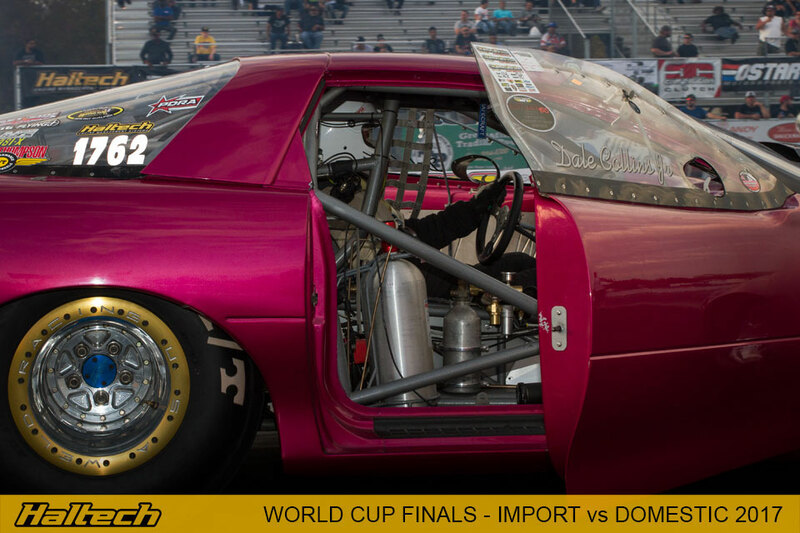 The alcohol slurping ‘stang is powered by a 540ci Noonan Hemi twin turbo and runs a Haltech, Elite 2500 + REMd and an IQ3 logger dash. 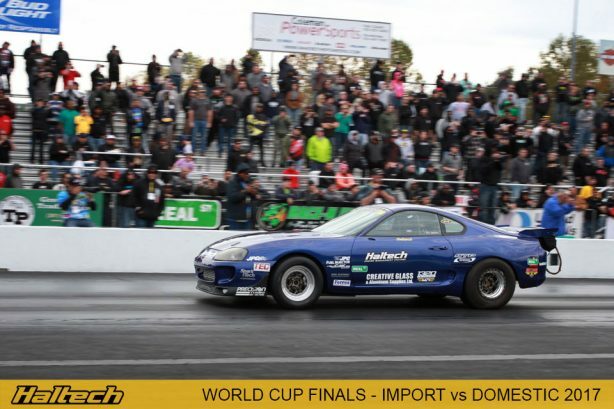 Damon Chin’s Rude Bwoy Toyota Celica has a 2JZ under the hood and runs a Haltech E2500 + REM. Damon was unfortunately off his best pace in qualifying then went down to Rich Bruder in Round 1. In Radial vs Modified Jimmy Dolan was reaching for the stars in his small block Ford powered F150 Lightning “The Yetti”. Jimmy currently runs a Haltech Elite 2500 and IQ3 logger dash, but has a REM kit in the wings, as he’s preparing to swap from race gas to alcohol next year. 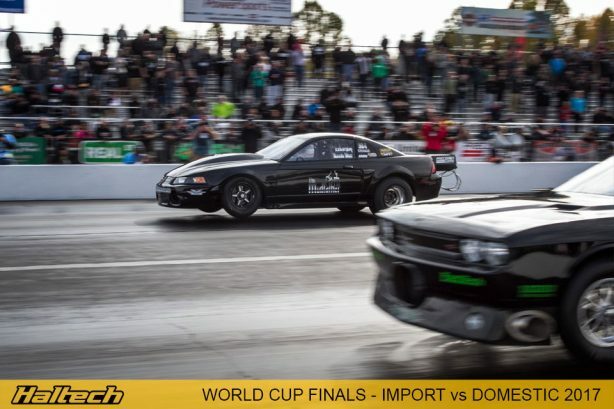 He set a new PB in Round to with a 7.152@191mph, but it wasn’t quick enough to beat Rafaelito Racing’s RX-8A who went on to win the class. In X275 vs Hot Rod, Brian Devilbiss was flying the Haltech flag right from the start. The Ford Mustang Shelby GT500, is the first 275 modular motor powered car into the 6s! 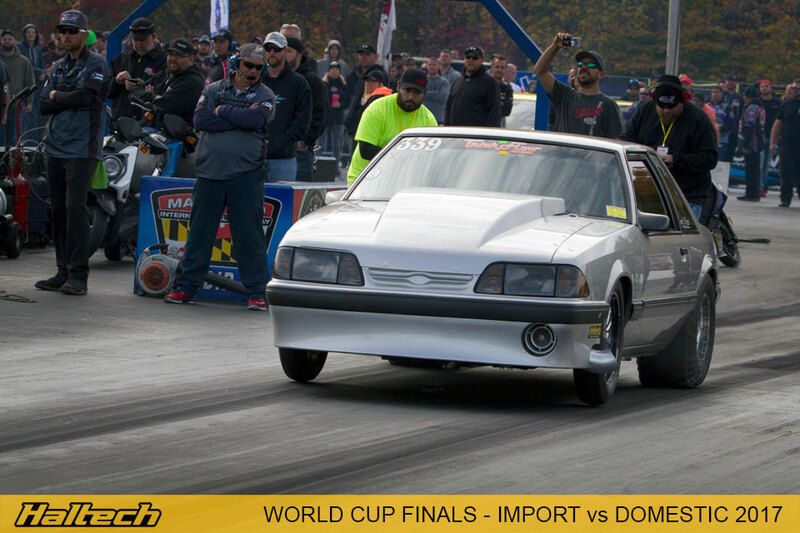 Martin Connelley set a new PB of 6.970@195mph in qualifying in his turbo small block Ford fox body Mustang. He later set a top speed PB breaking the 200mph for the first time. 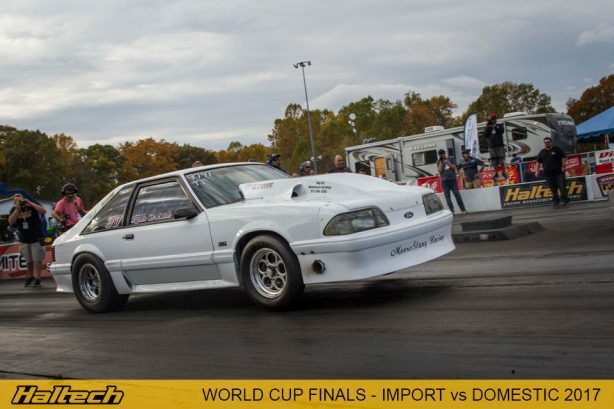 Craig Walls’ supercharged small block Ford Mustang looked fierce on the track. 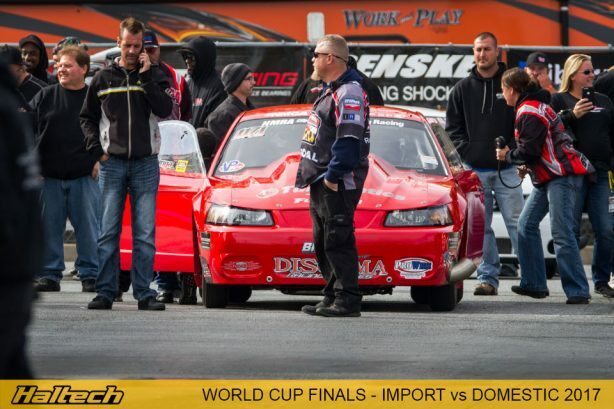 In Street Fighter class Mike “Gastroker” Wohler PB’d in qualifying with 7.884@190mph. The Mitsubishi Eclipse, unfortunately, went down to Anton Clements’ Mustang in Round 2. 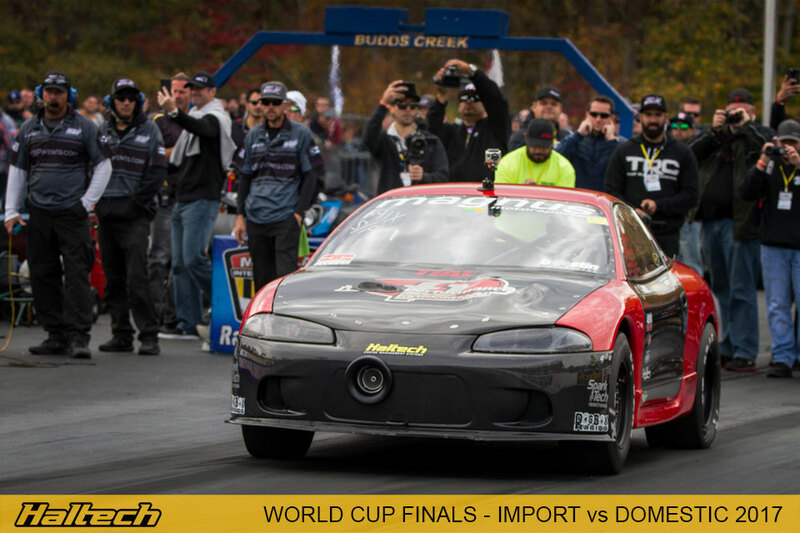 Devin Schultz’s Eagle Talon managed a PB in qualifying with 7.548@182mph but was beaten Round 1 by Jim Coger’s ’89 Mustang. 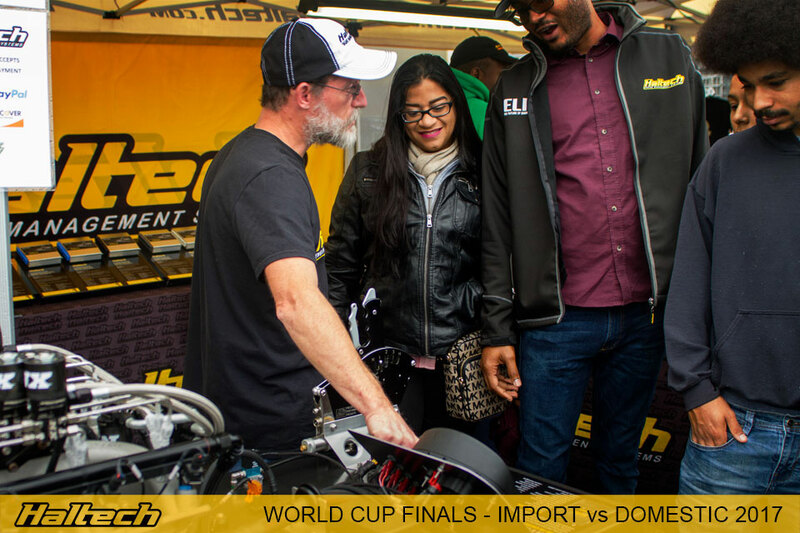 And while there was plenty of action on the track, off track things were just as exciting with the Haltech USA crew scaring the passers-by with nitrous and launch control demonstrations using the Elite ECU range. We’d like to thank all the racers and fans who came along to make the 22nd Haltech World Cup Finals one of the biggest and best events of the year and congratulate all the class winners who put their heart and souls into getting across the line first. 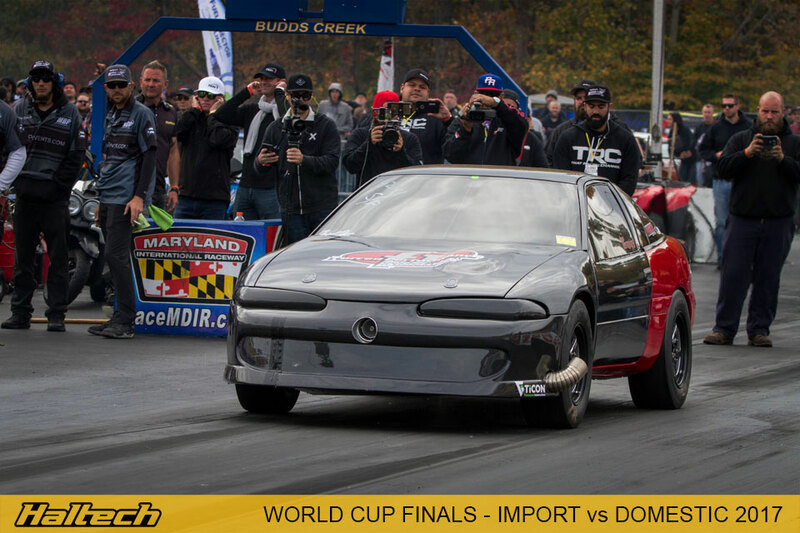 Bring on the 23rd World Cup Finals, Oct 31 – Nov 4, 2018!